The sign looks cute on it's own, however, we wanted to make it true so we've been crafting up some creepy-crawlys around here. Nothing ground breaking, nothing really new. However, they are pretty cute so it's worth sharing. 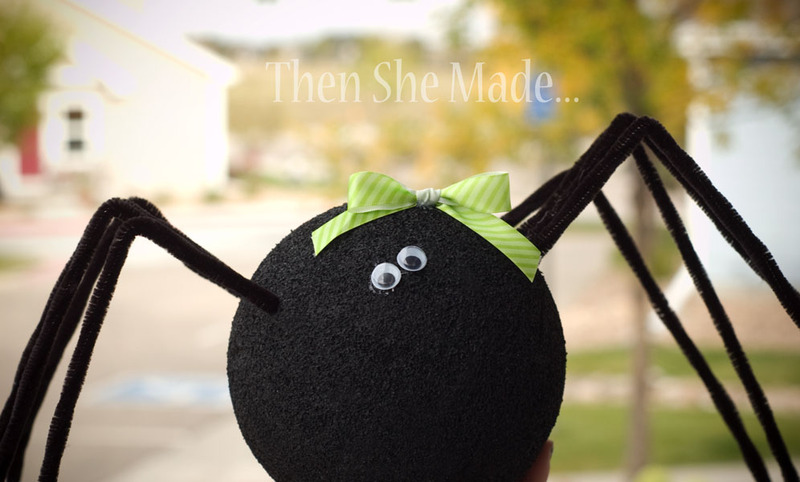 Plus, maybe you didn't know they were so easy to make and well, now you do! And, as a bonus, this is a great craft for the kiddos to help with or even do on their own. 1- Put something down to protect your work surface, I used wax paper because it was handy. 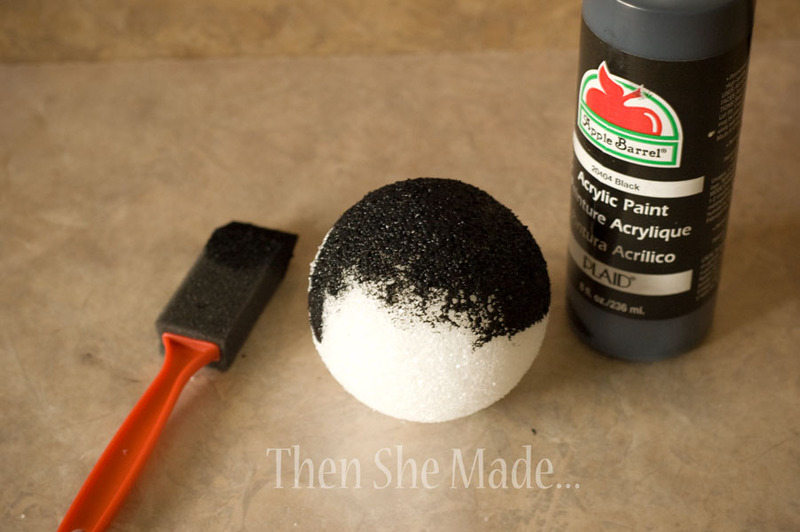 Then paint your styrofoam ball. 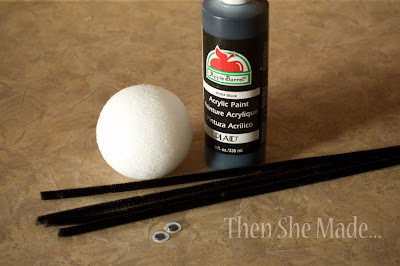 Tip: When painting styrofoam with acrylic paints, it's best to "dab" instead of "brush" the paint on. Dabbing gets the paint down into the holes. Also, it's easier to paint a styrofoam ball if you aren't holding the ball itself. Try sticking it on a toothpick. This way, you hold onto the toothpick and rotate the ball as needed while painting. Simple? Yes! But, and I almost hate to admit this, it took me a few times before I realized this - note the painted fingers in the pictures. 2- Once the paint is dry, simply add your legs, eyes, and any other items you want. I added a bow because I think girl speeiiiiiders are cuter than boy speeiiiiders. 3- Now you are ready to hang them up. 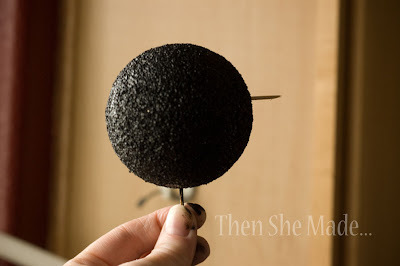 The fun thing about this craft is that they are quick and easy to make so you can make a ton of them in practically no time at all. The hardest part is just waiting for the paint to dry. 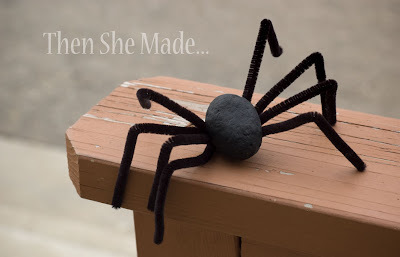 Also, since styrofoam balls come in so many different sizes, your spiders can be different sizes too - awesome! I got the idea from Eighteen25 when Rebecca Cooper was doing a guest post a few weeks ago. The only thing is I used pipe cleaners for the legs instead of wire and I think they turned out pretty cute. I actually like the fury legs better than the wire legs she used just because I think the pipe cleaners make the legs look hairy and creepier. So that's that. Enjoy! 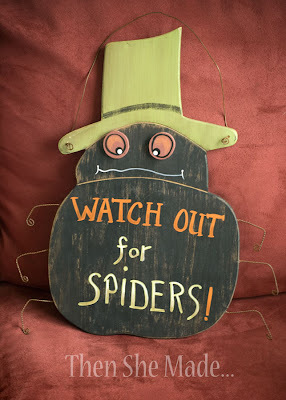 Oh, and Beware of Spiders! I can't wait to make these. And I love Megamind! My favorite part is Megamind's victory dance into the city and his victory speech in the beginning. My daughter and I want to make a bunch of these for our front porch. What a cute project!!!! 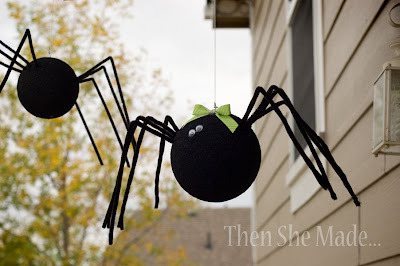 :0) How do you attach the string to hang the spider? I'll be making a nest full of these for our front porch, thank you!